It’s a place where Deschutes Brewery offers beer fanatics a spot to “pitch a tent” of sorts – and find their footing with the cornerstone of Mirror Pond Pale Ale. Deschutes Brewery Base Camp Week is a celebration of Mirror Pond’s easy-drinking goodness, along with many more of the brewery’s passion-heavy, pioneering brews. The Deschutes Brewery team is traveling around to cities all over the west this year, providing passionate fans with a seriously fun exploration of beer. Make the trek to Base Camp. 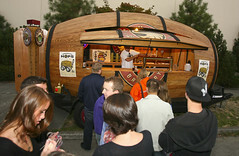 The week will include specialty beer tastings, beer and food pairings, and appearances by Woody, their giant beer barrel/bar on wheels. You’ll also be able to meet some of the brewers and staff from Deschutes. Following is a full list of events with descriptions. Kicking off eight days of celebratory beer drinking made possible by Deschutes Brewery’s Base Camp. We’ll be whooping it up on the back patio with music, BBQ and goodie bags for home brewers. Special cellared, Reserve Series brews on tap – they are a surprise for the night! We have a profound and solid love for all things cycling here at Deschutes Brewery (hosting many world-class events on our HQ property in Bend, Oregon, including the 2009 & 2010 Cyclocross National Championships). That’s why we’ll be at these crazy Cyclocross events during our Seattle Base Camp with Woody, pouring beer for thirsty spectators and post-race athletes. Think you’ve got what it takes to bowl a perfect game? Get your team together and roll your way to victory – and a trip to Bendto visit Deschutes Brewery. Winner gets a $200 gas card, a private Deschutes Brewery tour, $50 at the Bend Pub, one night’s accommodation and a choice of an outdoor adventure. Whew. But, even if you don’t win, you’ll have a chance during this event to sample some hard-to-find Deschutes Brewery beers, including the Black Butte XXIII anniversary brew. We’ll be raffling off some great prizes too. Best of all? The whole evening is a benefit for the Leukemia/Lymphoma Society. Bowling, beer and a good cause? We say it’s a recipe for a Monday evening to remember. To register a team, email mmarzano@deschutesbrewery.com. Ever thought – really thought – about the word “shindig”? We found out that it means a party or get together of some sort…OR a “spazmatronic dance.” So, we’re inviting you to join us (spazzy dancing or not to the music of One Man Band, Tony Smiley) for an evening with Deschutes Brewery. We’ll be pouring a wide variety of brews from Bend, Oregon including the famous Mirror Pond Pale Ale and Black Butte Porter, plus some specialty brews like The Stoic and Fresh Hop Mirror Pond. Come on down for cigars, $5 growler fills, raffle items and, of course, great craft beer. An evening featuring The Atomic Bombshells: Seattle’s internationally celebrated, polished and perfectly-choreographed, professional burlesque troupe. Intimate tasting of Deschutes Brewery’s Reserve Series beers in the grotto begins at 7:30pm, with a sneak peek at the burlesque show – so get there early! Space is limited. Actual show begins at 8:30pm – you don’t want to miss this! Post show, come hang with a D.J. rocking the house and Deschutes Brewery beers flowing from the taps. Deschutes Brewery will bring its giant traveling beer barrel, Woody, down to the Brave Horse to celebrate happy hour in style. DJ Lunchbox rolling some sweet beats, games (like the endless fun of bocce ball), lots of craft beer – including Deschutes Brewery’s summer Twilight Ale and an outdoor BBQ? It doesn’t get much better than that. You know the tunes will be good when you come to Nectar – stay tuned on www.deschutesbrewery.comand follow @deschutesbeer on Twitter to find out when our live show of the evening is announced. Join us to sample some of Deschutes Brewery’s Reserve Series beers, such as its anniversary brew – Black Butte XXIII. Capture the evening’s fun times with a custom photo booth! Each year, Deschutes Brewery bottles up the taste of the holiday season with its renowned Jubelale. A different regional or local artist is chosen to create some winter-inspired art to adorn the label of this beloved brew. These one-of-a-kind pieces of artwork translate into enjoyable art for all the Jubelale drinkers out there. Come share the art – of the beer and the labels – with us! This evening is a deluxe immersion is beer and food pairing. With camp-style BBQ menu items prepared with Deschutes Brewery beers – you can expect to savor such mouth-watering recipes as deviled eggs with crisp pork belly braised with Green Lakes Organic Ale and chef-carved beef brisket with Black Butte Porter BBQ sauce. And that’s just the beginning…the menu just gets more amazing from here. You’ll also enjoy a wide selection of Deschutes beers both on draft and in bottles.Live music, friendly folks from the brewery, goody bags and much more! Join us for a rip-roaring, good old-fashioned, honky tonk good time with Deschutes Brewery’s Twilight Ale, Black Butte XXIII, The Stoic and the new Chainbreaker IPA. We’ll be doing it up Southern style at Sweet Lou’s with dancing, festivities, and pint specials all evening long. The Fremont Oktoberfest is dear to our hearts because Woody’s debut occurred here in 2007. We’re excited to bring Woody and his lounge back to build more memories at this fall kick-off celebration in the Fremont neighborhood, otherwise known as the “Center of the Universe”. Voted by USA Today and Orbitz.com as one of the top places to toast Oktoberfest, this three-day event has an activity for kids and adults of all ages! Reserve beer sampling, Theo’s chocolate, Beecher’s cheese, Cupcake Royale birthday cupcakes and other celebratory fun will be had to ring in Woody’s 4th birthday! The Fremont Chamber of Commerce is the beneficiary of Fremont Oktoberfest.